The phone rang just before noon on January 31, 1996. The call was a request for a medical patient pick up in Phoenix with a transport to Tucson. The weather in Flagstaff had been overcast and snowing during the past few days as a winter storm front was moving through northern Arizona. Pilot Stephen Tulley filed the flight plan while flight nurse Laura Parada and respiratory therapist Karen Peebles made sure all the required medical equipment was on-board and ready. The flight departed at 12:28 PM in light snow, but shortly after takeoff Mr. Tulley reported an unsafe landing gear light indication which he managed to resolve after several minutes. At 12:51 PM, the pilot requested a clearance back to Flagstaff which Albuquerque Center approved. At 12:57 PM, the center controller cleared the flight for an ILS approach and terminated radar service. Contacting the Flagstaff control tower, Tulley was informed of the current weather and to report inbound on the ILS instrument approach. Mr. Tulley acknowledged the transmission at 1:02 PM. No other radio contact was received from the flight. The aircraft dropped off radar at 1:05 PM. During the initial search phase for the missing aircraft, radar data was obtained by the FAA (Federal Aviation Administration) from Albuquerque Center and reviewed. It was found that the aircraft flew west of the published outbound course and dangerously close to the San Francisco Peaks. The radar data was refined to reveal large variations in altitude, heading, and airspeed as the aircraft headed north from Flagstaff. After an intense multi-agency search operation, the aircraft was finally located on February 3, 1996 by a Department of Public Safety helicopter searching along the northeast side of Rees Peak. 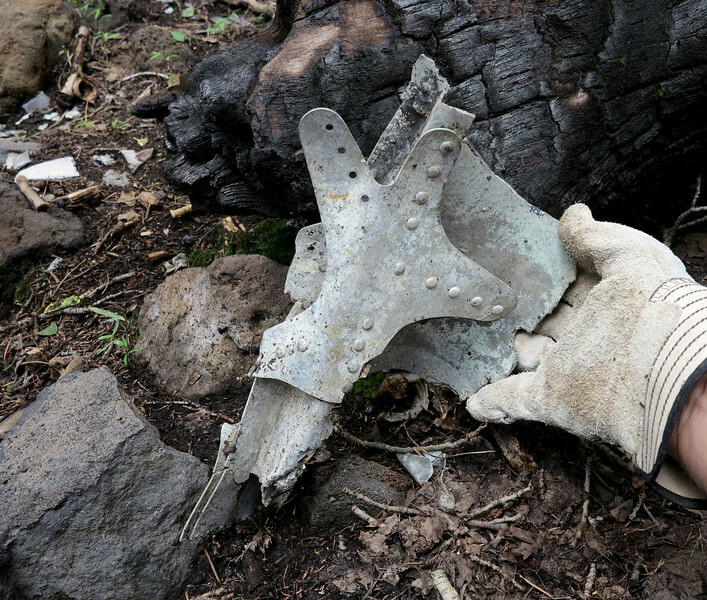 The burned remains of the aircraft and its three occupants were found 15 miles north of Flagstaff Airport and 10 miles west of the final approach course. The FAA was concerned with Guardian’s operating procedures and policies both before and after the crash. On September 5, 1996, the FAA issued an emergency revocation of Flagstaff Medical Center's (FMC) air carrier certificate. In its revocation order, the FAA faulted FMC/Guardian Air on eight counts, with numerous alleged violations in support of each count. One of the principal charges was that Guardian’s program director, a nurse, had controlled aviation operations despite being unqualified to do so. 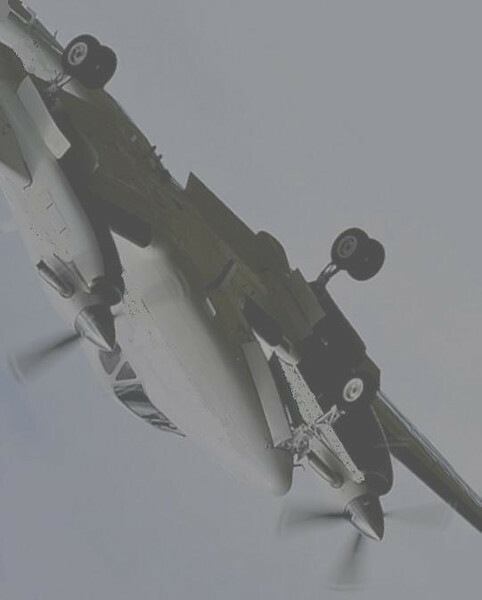 Other alleged violations included lack of training; falsifying a pilot’s duty log; an employee working during a required rest period; requiring employees to perform duties not necessary during aircraft liftoff; and not having timely procedures to notify the FAA or a search and rescue team if a Guardian plane is overdue or missing. I began my search for the crash site of "N300SP" in September 2013. Having two old coordinates from our local Search and Rescue unit, I started the hike up Rees Peak early morning. 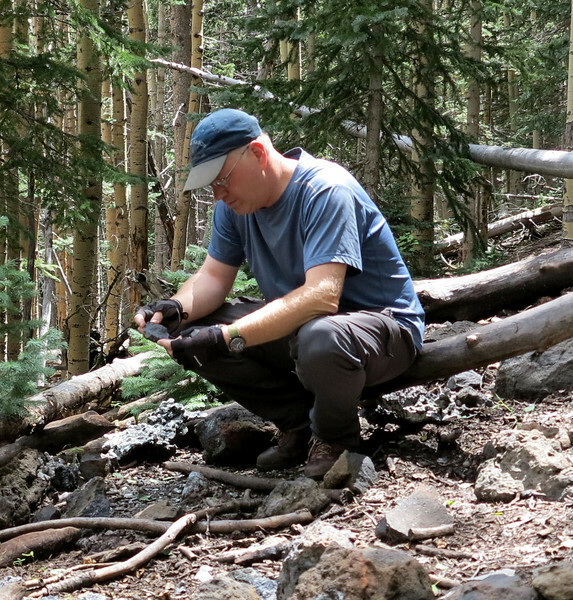 I found nothing at the first coordinate and hiked to the second marked location. 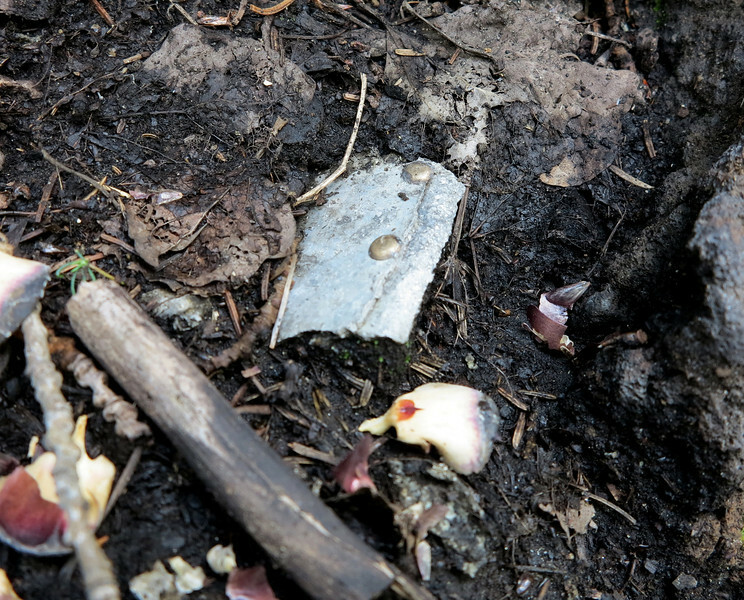 I found a small fragment of aircraft aluminum and knew I was close. It wasn't long before I found another fragment and then shortly after, the point of impact of the Beech E-90. 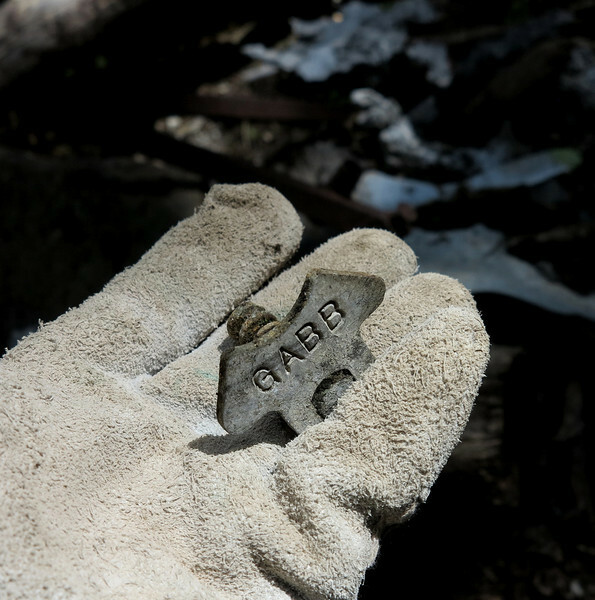 I was able to identify the crash site with fragments of painted wreckage, a medical oxygen valve, and a memorial cross with the partial name of the pilot. 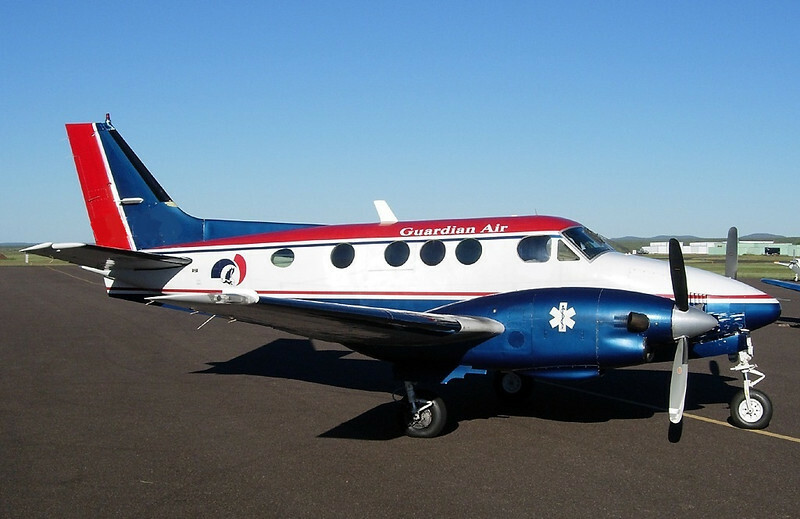 The Beechcraft E-90 King Air (N300SP) was owned by Flagstaff Medical Center and operated by Guardian Air Transport, a subsidiary at the time of Flagstaff Medical Center. The aircraft was based in Flagstaff, Arizona as the primary EMS (Emergency Medical Services) Aircraft. It was equipped with two Pratt and Whitney PT6A turboprop engines. Total airframe time on the aircraft was 5,952 hours. 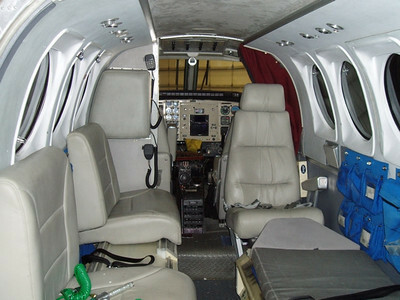 The interior cabin of the Guardian Air Beech E-90 was typical of most air ambulance aircraft. Guardian Air operated their aircraft with only one pilot. The flight nurse and other technicians would sit in the cabin and tend to the patient. THE CREW OF GUARDIAN AIR "N300SP"
Pilot Stephen (Steve) Tulley, age 60, held an airline transport pilot certificate and had accumulated more than 10,700 flight hours with 613 hours in the make and model of the accident airplane. 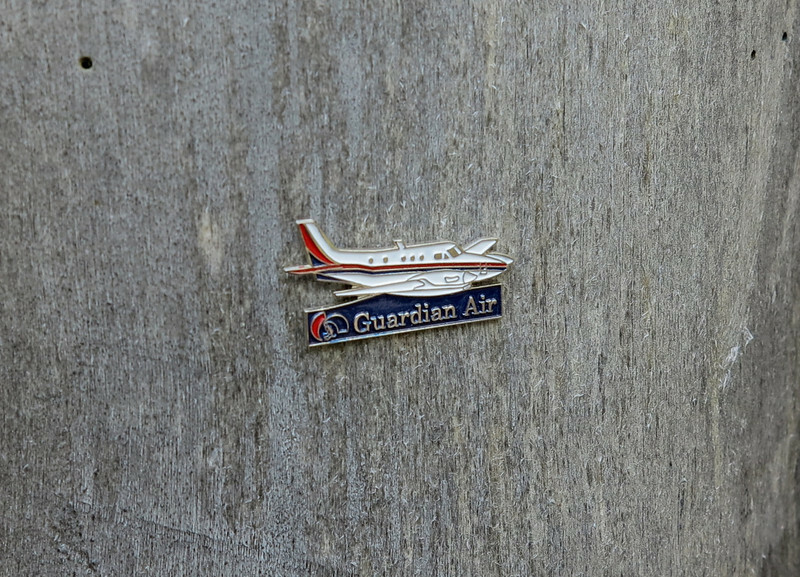 He had been with Guardian Air since 1992. 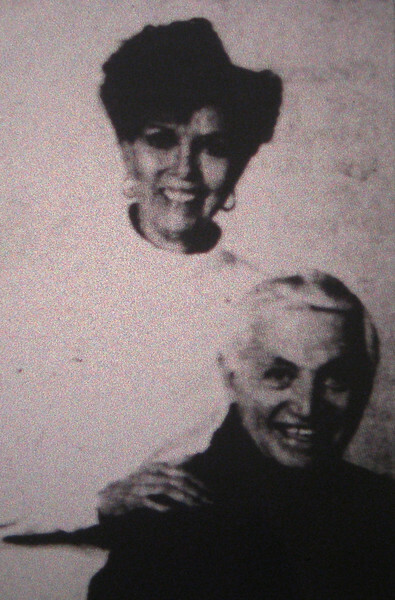 Pilot Stephen Tulley poses with his wife Susan in an undated photo. The Tulleys, at the time of the accident lived in Parker, Arizona. Laura Parada, age 31, was a flight nurse with Guardian Air Transport. She had been working for Guardian since April 1995 and loved her job. 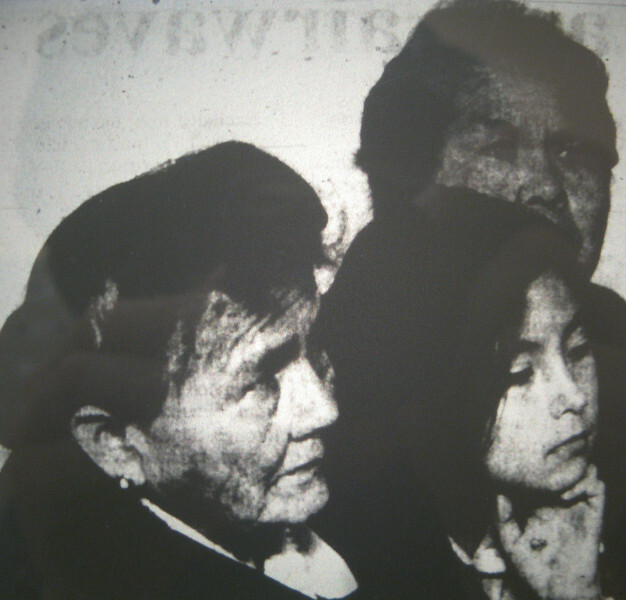 She left behind a husband and two children, all from Flagstaff. 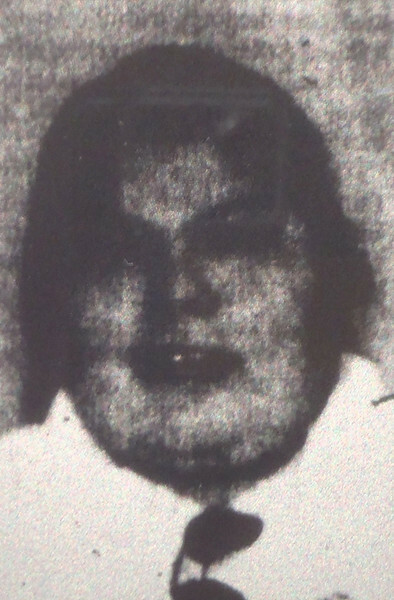 Karen Peebles, age 34, lived in Tuba City, Arizona. She was a pediatric respiratory technician. She had been working for Guardian since 1993 and Flagstaff Medical Center since 1990. Relatives of Karen Peebles, from left Mabel Chico, Karen's maternal grandmother, Brianna Peebles, her daughter, and Annie Sneezer, her mother, waited in a Flagstaff motel Saturday for word of the missing plane. 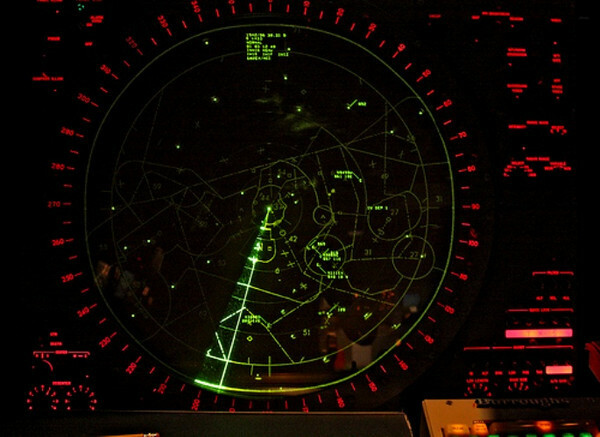 An Instrument Landing System (ILS) is a ground-based instrument approach system that provides precision guidance to an aircraft approaching and landing on a runway, using a combination of radio signals and high-intensity lighting arrays to enable a safe landing during weather conditions such as low ceilings or reduced visibility due to fog, rain, or blowing snow. 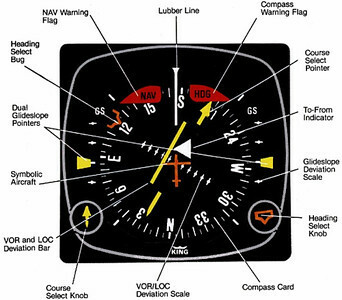 The Horizontal Situation Indicator (HSI) can appear intimidating to non-pilots, but to an experienced instrument rated pilot the information displayed can provide very accurate information to safely conduct an instrument approach. The accident aircraft was equipped with this particular piece of navigation equipment. 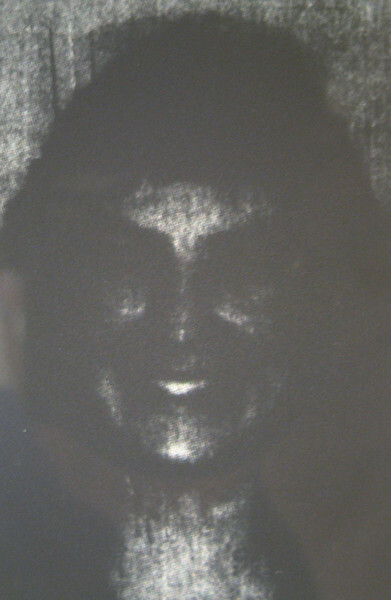 The accident investigation revealed that the Heading Select "Bug" was set at 210 degrees on the HSI Compass Card. This is also the inbound heading for the ILS final approach course. At 15 miles from the runway and 10 miles west of the final approach course, the accident aircraft was well outside of the reliability area to conduct a safe ILS approach. The close proximity to mountainous terrain further degraded a reliable course signal. Over the years some have questioned why radar service was terminated after the flight had been approved for the ILS approach? According to Albuquerque Center in 1996, radar coverage of an aircraft was usually lost at about 10,000 feet MSL near Flagstaff. Because of this sporadic coverage, Albuquerque Center did not provide radar vectors to the final approach course. To date, radar coverage is still unreliable in the Flagstaff area and radar vectors are not provided for instrument approaches into Flagstaff Airport. 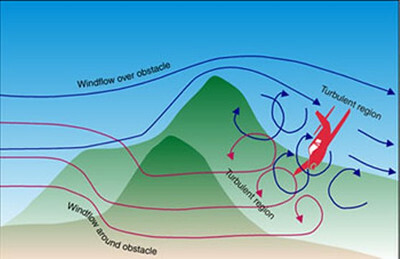 Mountain Wave Turbulence occurs when strong winds blow approximately perpendicular to a mountain range, the resulting turbulence can be severe. Encounters have been described as similar to hitting a wall. In 1966, clear air turbulence associated with a mountain wave ripped apart a BOAC Boeing 707 while it flew near Mt. Fuji in Japan. The on-scene examination of the wreckage by the NTSB revealed that the aircraft with it's landing gear extended had descended vertically onto the slopes of Rees Peak at about the 10,500 foot level. 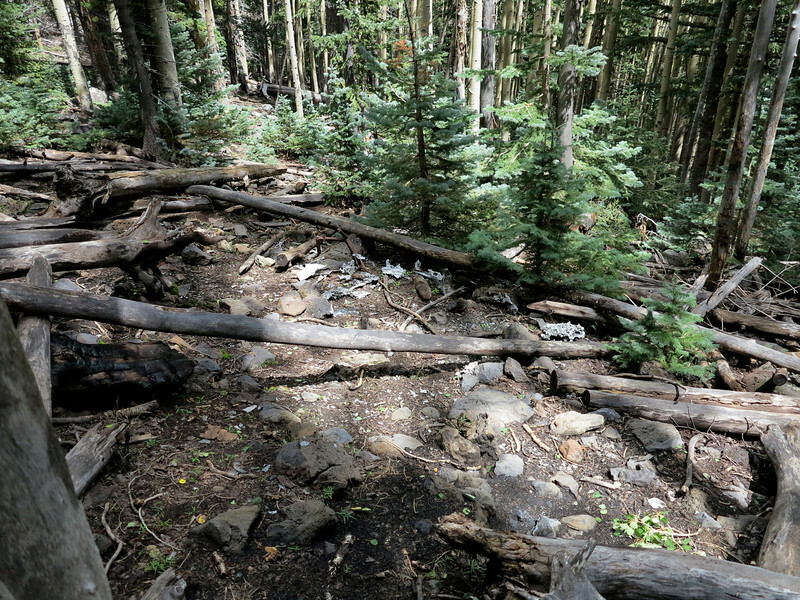 The steep angle of the uncontrolled descent suggests the pilot had lost control of the aircraft while flying in the clouds along the lee side of the San Francisco Peaks. Winds in the Flagstaff area were forecast to be out of the southwest at 30 to 40 knots. This photo illustrates how difficult it was to locate the crash site. 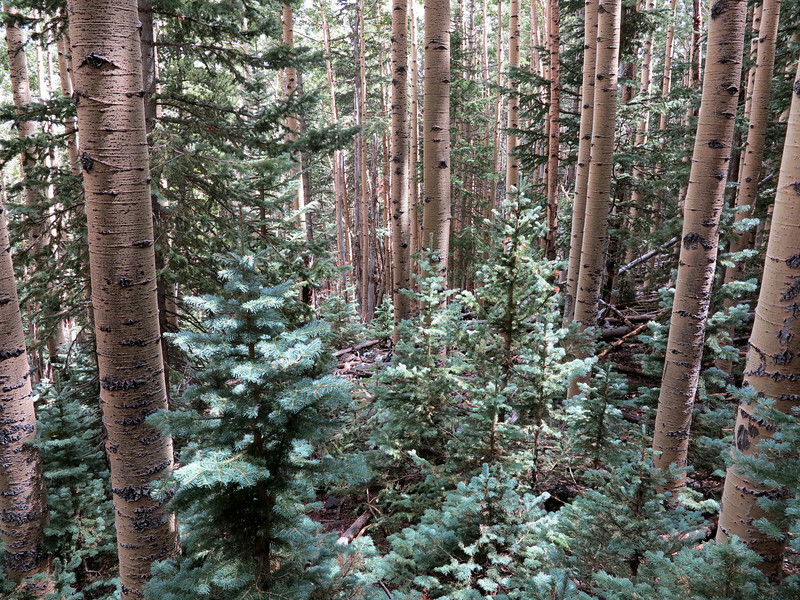 The impact site of "N300SP" is about 30 feet into this dense stand of Aspen trees. A small impact crater or depression marks the point of impact for the aircraft. Small pieces of burned wreckage lie nearby. The entire crash site lies within a 20 foot radius. The short condensed debris path is consistent with a vertical descent to the ground. Looking straight up through the Aspens where the aircraft descended. It is unknown from what altitude the pilot lost control of the aircraft. 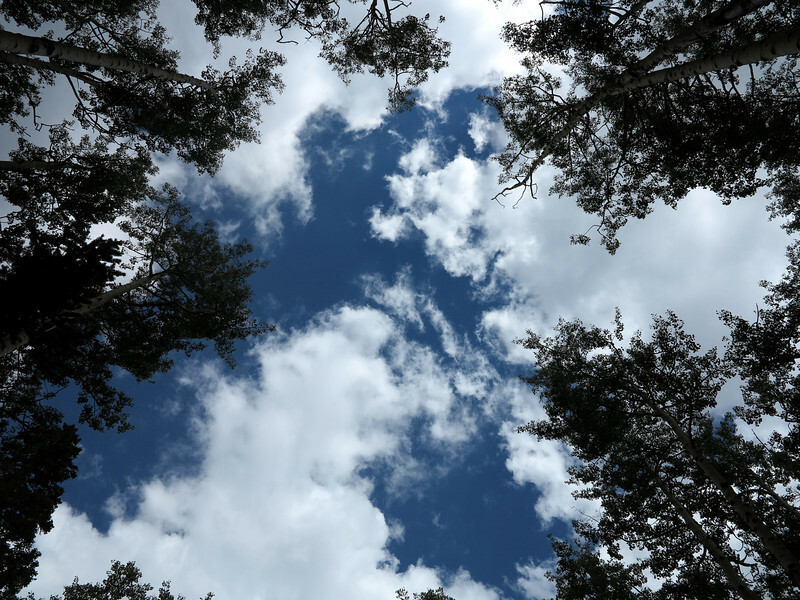 The accident investigation confirmed that the aircraft contacted no trees or branches in its fall. 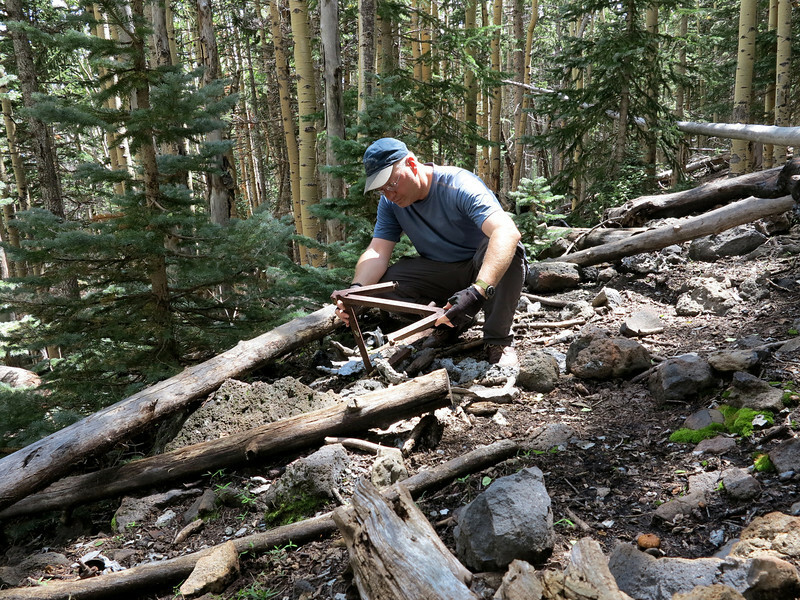 During my visit to the site I examined a mangled seat frame at the impact crater. 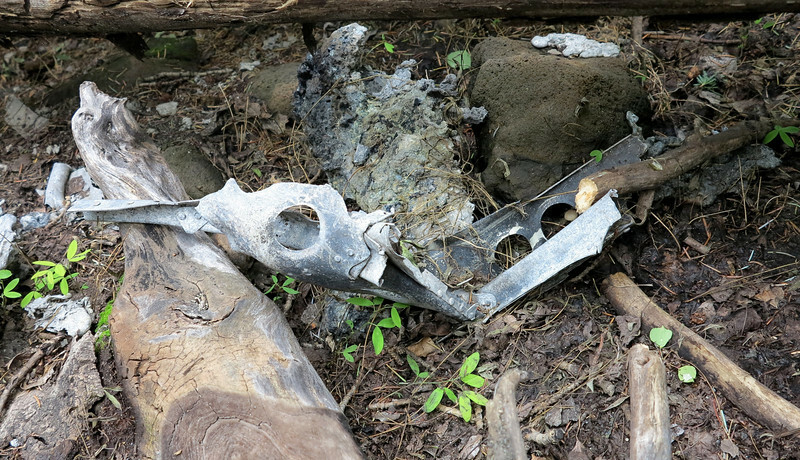 The seat frame was found amid melted aluminum and other debris. 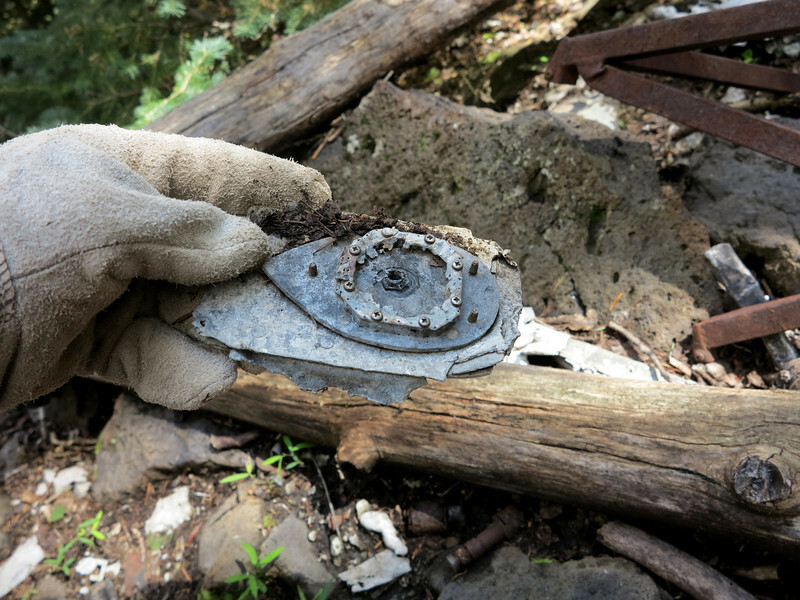 A fuel tank cap release tab was located at the site. The aircraft was fueled to near capacity. Departing Flagstaff with 320 gallons of Jet-A fuel. A flight control structural rib, possibly aileron or wing flap lies twisted and burned. The left wing sustained a majority of the post crash fire damage while the right wing was relatively intact. An antenna base plate mount still attached to a portion of airframe. I could not identify if this was the remains of a communications, loran, or GPS antenna. A medical oxygen regulator valve was once connected to a pressurized cylinder. It was noted during the NTSB accident investigation that all oxygen bottles had ruptured during the impact and post crash fire. 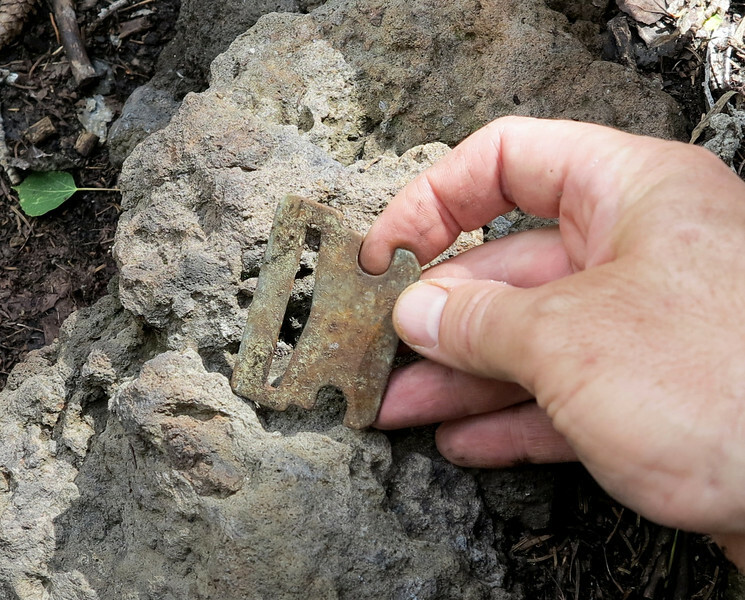 During my time at the crash site I documented numerous small fragments that remained. A majority of the wreckage was recovered from the crash site and taken to a facility in Phoenix for further examination. 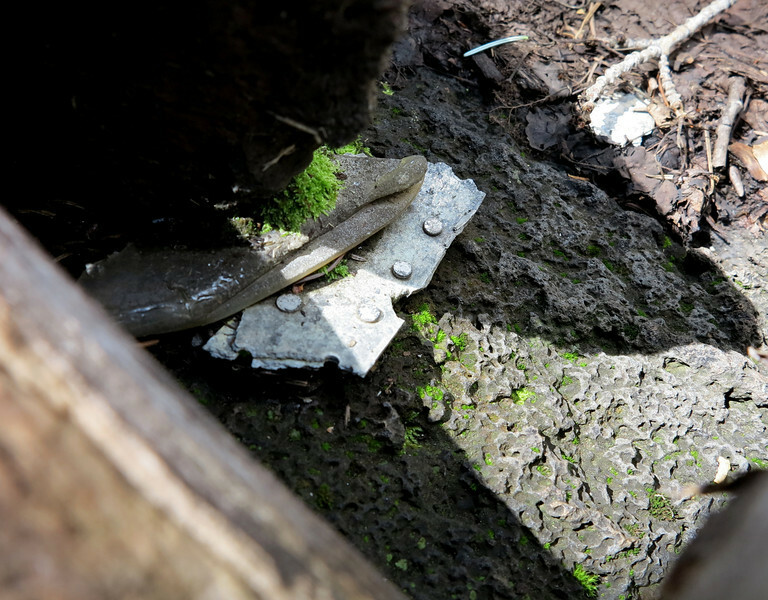 Many fragments were small and wedged in the mud and between rocks and fallen trees. 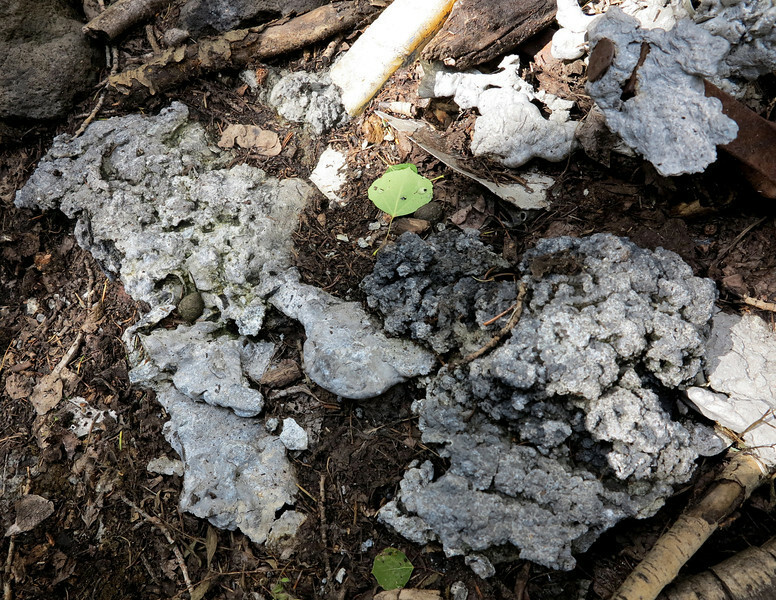 Some fragments have lichen attached to their surfaces. The northeast slope of Rees Peak receives more rainfall and moisture than the other peaks in the range. 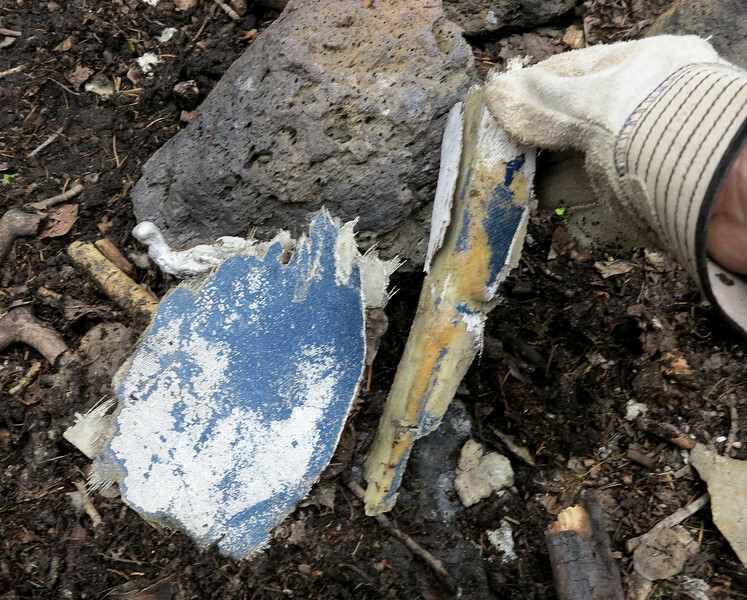 These two pieces of fiberglass material had dark blue paint characteristic of Guardian Air's paint scheme. 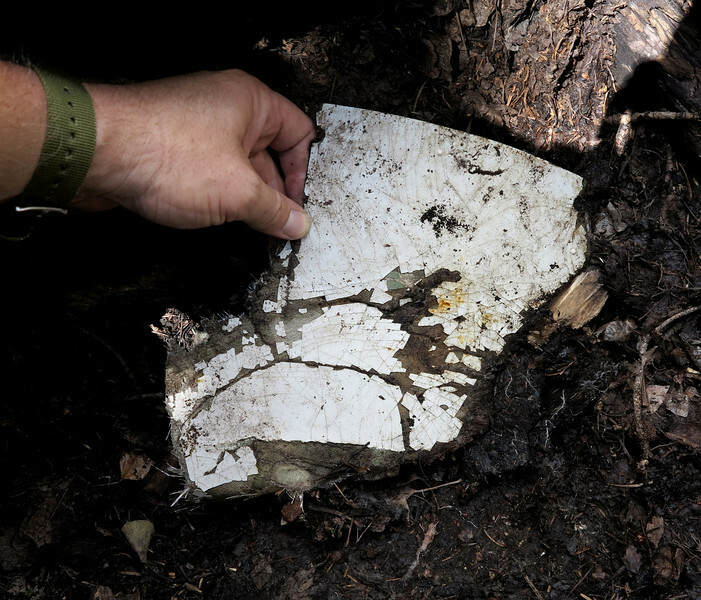 This fragment was painted with the overall white paint of the aircraft. The aircraft's overall white paint scheme camouflaged the wreckage on snow covered Rees Peak. A change in the appearance of the snow alerted searchers from the air of the crash site location. A seat-belt or strap tab once used to secure a passenger to a seat or possibly a patient to a gurney during transport. The post crash fire was intense and burned for several hours after the crash, but there were no witnesses to the fire due to overcast clouds shrouding the mountain. The next day there was little left of a recognizable aircraft. A majority of the fuselage and cabin was reduced to these nodules of melted aluminum. 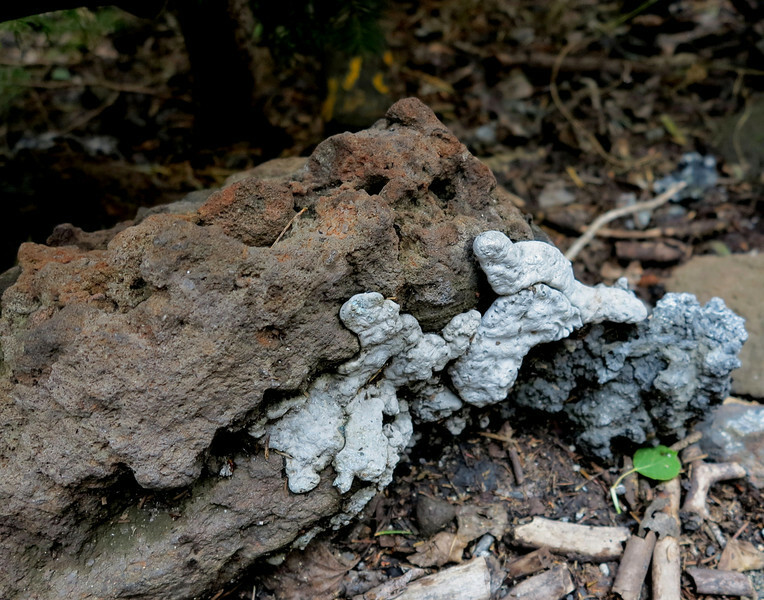 Some of the melted aluminum was found to have adhered to pieces of exposed lava rock. It was found during the NTSB accident investigation that both engines were producing power at the time of impact. 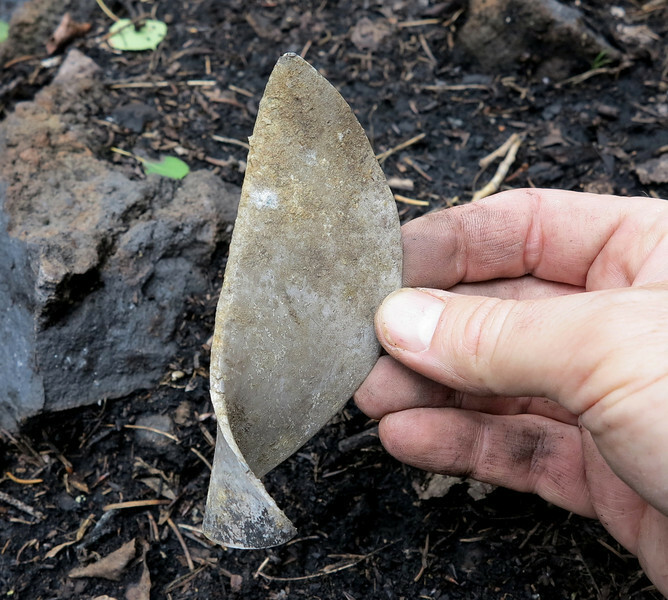 During my visit to the crash site, I located this propeller tip that broke off from one of the six propeller blades. Fragments of window Plexiglas. 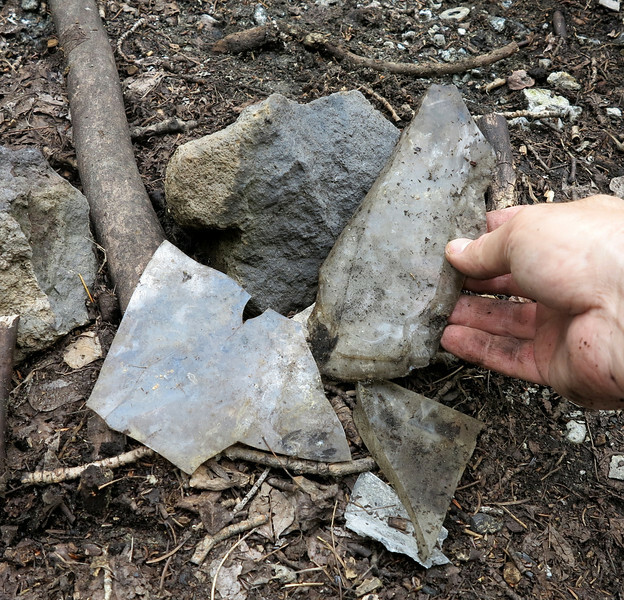 These were the only fragments I located at the site and all were found outside of the impact burn area. 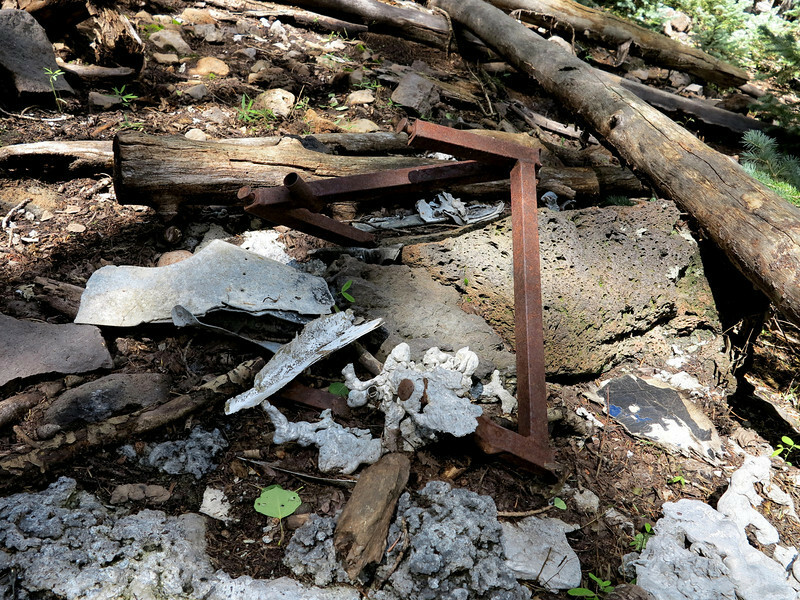 Aside from the seat frame, the second largest fragment at the crash site was this burned piece of aluminum structure. The landing lights on the Beech E-90 are attached to the landing gear which was extended prior to the accident. 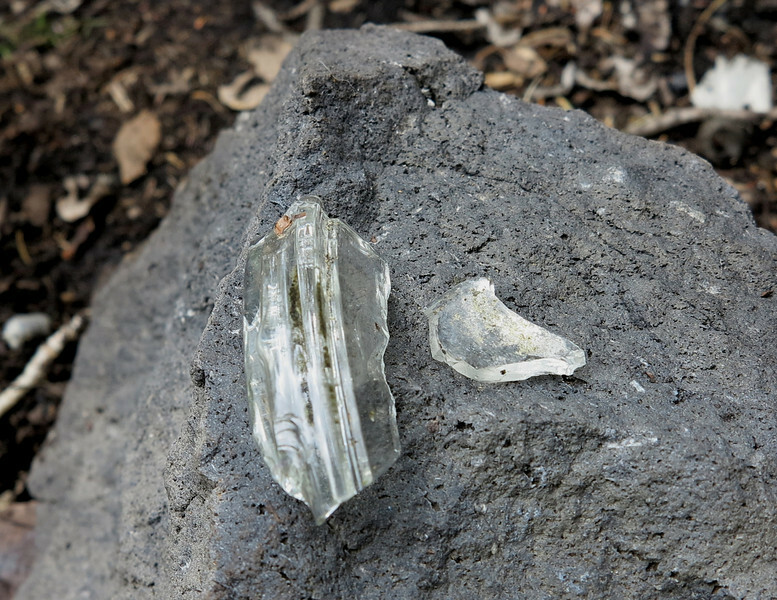 These fragments of glass are pieces of the landing light lenses. 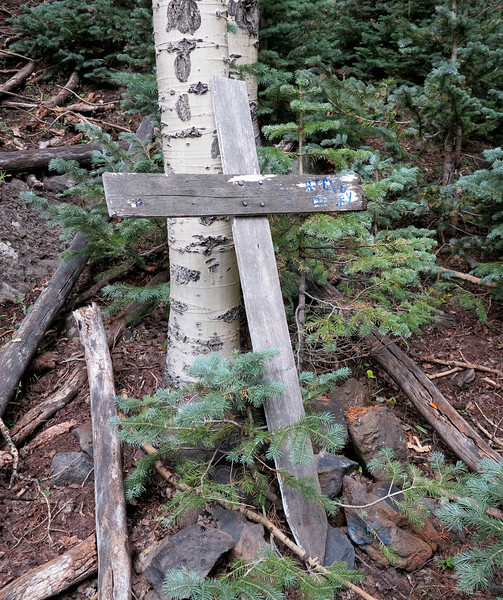 This memorial cross was located near the crash site. 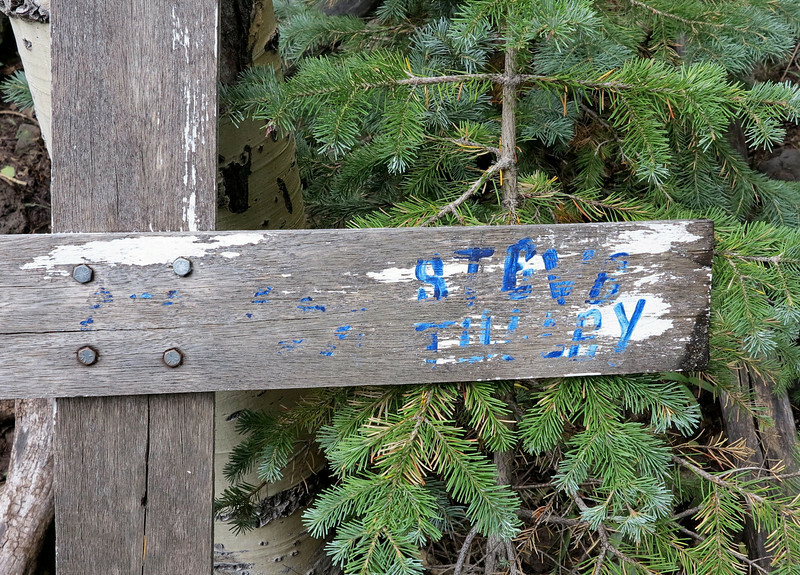 It was weathered from years of exposure to wind, rain, and snow. 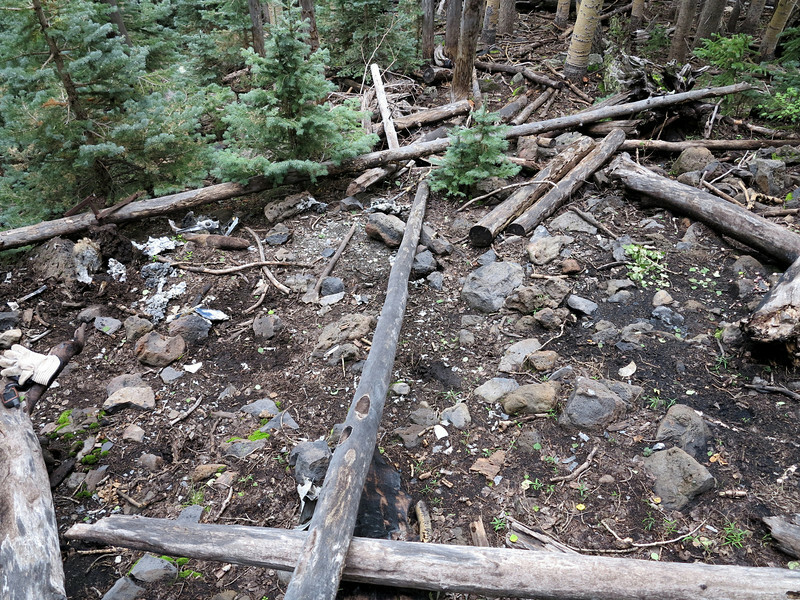 The cross was most likely placed at the site shortly after the accident by family and friends of the victims. 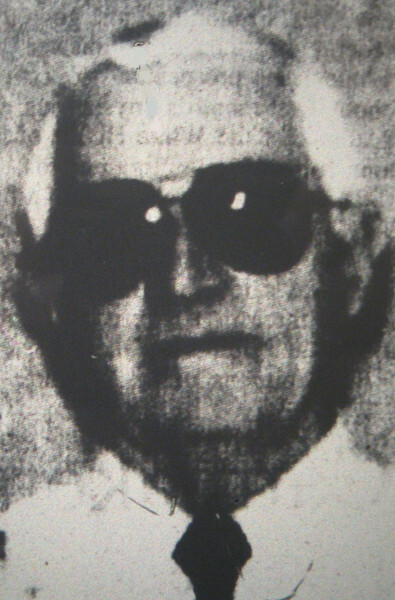 The only name that was partially visible was that of pilot Steve Tulley. 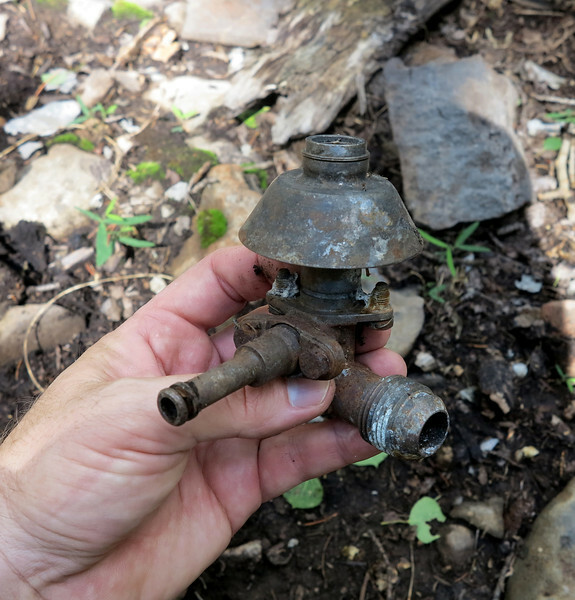 During my visit to the site I left this small Guardian Air pin in memory of the crew that lost their lives on Rees Peak.